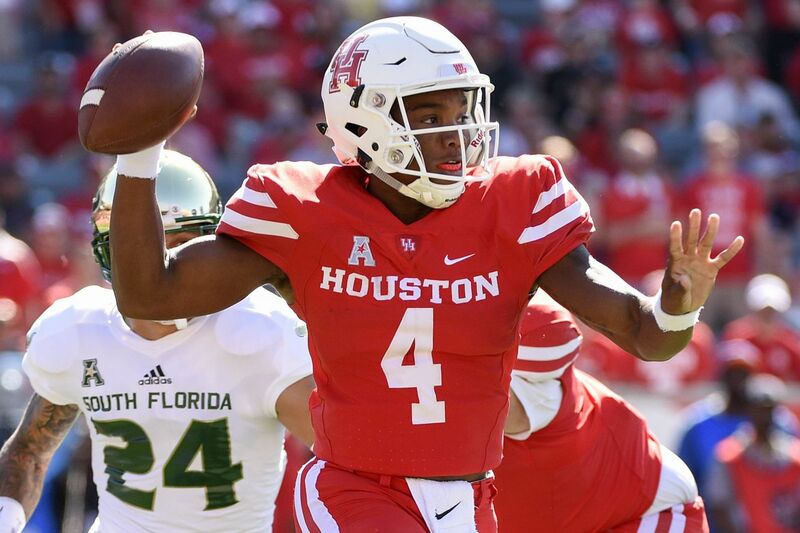 A converted wide receiver, Houston Cougars quarterback D’Eriq King has become an explosive quarterback. He has thrown for 30 touchdown passes and run for 12. All week, Temple has been putting in extra time preparing to stop the explosive Houston offense. Which means the Owls have paid plenty of attention to Cougars junior quarterback D'Eriq King. Temple (5-4, 4-1 American Athletic Conference) must contain King if the Owls hope to upset host Houston (7-2, 4-1) on Saturday and become bowl-eligible. Houston's average of 47.7 points ranks fifth nationally. Temple-Houston prediction: Can the Owls bounce back and upset the Cougars? A converted wide receiver, King has become an explosive quarterback. He has thrown for 30 touchdowns and run for 12. That means he is responsible for 28.2 points per game, which leads the nation. He is sixth nationally in total offense, averaging 338.3 yards. It's the third straight dual-threat quarterback the Owls will face. In a 24-17 overtime win over Cincinnati, the Owls limited Desmond Ridder to 111 yards passing and 9 yards rushing (on 16 attempts). Last week, the Owls struggled with McKenzie Milton in their 52-40 loss at Central Florida. Milton threw for 312 yards and three touchdowns and rushed for 19 yards and a score. "McKenzie was really good and I think this quarterback is faster and better with his feet, so it is definitely a challenge, and if everybody does their job and stays where they are supposed to be, we should be all right," Temple linebacker Shaun Bradley said. Just 5-foot-11 and 195 pounds, King provides a combination of elusiveness and speed. "They run a lot of RPOs [run-pass options], and you have to know how to transition to a pass rush while also playing the run effectively," Temple defensive tackle Michael Dogbe said. "A quarterback who can run like that, you have to make sure you can contain him and not make those big plays." Good luck with that. King, who was a star high school quarterback, is second on the team in rushing with 467 yards (5.7 average). His 12 rushing touchdowns are more than half the Cougars' total of 23. He also has completed 63.4 percent of his passes for 2,578 yards. His 30 touchdown passes rank fourth nationally. His development is more impressive considering that he didn't switch to quarterback until partway through the ninth game of last season, before starting the final four games. In fact, during Houston's 20-13 win over Temple last season at Lincoln Financial Field, King had seven receptions for 51 yards and rushed for 15 yards and a touchdown on four carries. "He throws a really nice ball, can take the top off the coverage, but I have been really impressed with his accuracy as well," Temple coach Geoff Collins said. "His decision-making, he sees the rotation of the coverage, knows where to go with the ball, and he does things with the RPO game, running and keeping it, throwing it on the perimeter." And then there is his running ability. "The thing that is even more scary is when you have everything covered, he can make plays with his feet when a play breaks down, too," Collins said. Houston has plenty of offensive weapons, including four receivers who have four or more touchdown receptions, led by sophomore Marquez Stevenson (6-0, 190) who has 49 receptions for 823 yards and nine touchdowns. Yet the catalyst is King. "He has a really strong arm, throws a good deep ball," Temple cornerback Rock Ya-Sin said. "He is very dynamic in space and makes guys miss and is a really good player."